But he answered her not a word. And his disciples came and besought him, saying, Send her away; for she crieth after us. But he answered and said, I am not sent but unto the lost sheep of the house of Israel. Then came she and worshiped him, saying, Lord, help me. In the reading from the holy Gospel which has just been read, dearly beloved brothers, we have heard about the great faith, patience, constancy, and humility of a woman. What those of devout mind find most to admire about her is the fact, that although as a gentile she was completely separated from the teachings of the divine thoughts, she was nevertheless not deprived of the virtues which those thoughts proclaim. She had a great perfection of faith, since, imploring the Savior’s benevolence, she said, “Show me mercy, O Lord, son of David.” She named the Lord, “son of David,” so it is evident that she believed that he was true human being and true God. Though she was asking on behalf of her daughter, she did not bring her along, and she did not entreat the Lord to come to her daughter, so it is clear that she trusted that he could give her health by his word, his bodily presence not being required. And also, after many tears, finally she prostrated herself and adored him, saying, “Lord, help me.” This teaches us that she had no uncertainty concerning his divine majesty, since she said that his power was to be adored as God’s. She had no small measure of the virtue of patience. Although the Lord did not answer a word to her first request, she did not cease entreating him, but with a fuller earnestness she implored the help of his benevolence as she had begun. The reason the Lord kept her waiting for an answer was not that he, the pitying physician of the pitiful, disdained her petitions. Of him it was written most truthfully: The Lord has heard the desire of the poor. He kept her waiting for an answer in order to demonstrate to us the perseverance of this woman that we can always imitate. The more she seemed to be disdained by the Lord, the more ardently she persisted in the entreaties she had begun. He kept her waiting for an answer in order to declare that the minds of his disciples should also be merciful. As human beings they were ashamed of the clamor of the woman as she pursued them publicly; but he himself knew the character of his mercy, since he disposed all things in measure and number and weight. He kept her waiting for an answer lest an occasion be given to the Jews for finding fault with him for giving preference in teaching or healing to the gentiles over them, so that they might justly refuse to adopt faith in him. And this is what he said: “I have not been sent except to the lost sheep of the house of Israel.” He alone, by himself, was teaching the Jews; through his disciples he called the gentiles also to the grace of faith. Concerning them he said elsewhere, “And other sheep I have which are not of this fold, and them also I must bring, and they will hear my voice, and there will be one fold and one shepherd.” This is why when in his own person he was going to heal the body of a gentile girl, he did not carry this out before her mother’s incomparable faith had been proven to everyone. This mother also had the characteristics of constancy and humility surpassing all others. When the Lord compared her to dogs, she did not desist from the earnestness of her entreaty, and did not draw back her mind from hoping for the favor of his benevolence. Having willingly embraced the indignity she had received, she not only did not deny that she was like dogs, but even continued with a comparison of herself to young dogs. With this prudent argument she confirmed the Lord’s statement, but nevertheless she did not rest from the audacity of her request. 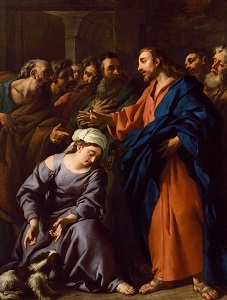 She confirmed the Lord’s statement in which he said to her, “It is not good to take the children’s bread and to give it to dogs,” as she answered, “Yes, Lord” — that is: “Truthfully, it is as you allege, that it is not good to take the salvation divinely intended for the people of Israel and to give it to gentiles.” But when she said, “For even the young dogs eat of the crumbs which fall from their masters’ table,” she very prudently demonstrated what great humility and what constancy she bore within her inmost heart. Being unworthy to be refreshed by the meal of the Lord’s entire teaching, which the Jews had for their use, she nevertheless supposed that however small the grace imparted to her by the Lord might be, it could be sufficient for her salvation. Hence from the benevolent Savior, who kept her waiting for a time, not out of lofty disdain for her entreaty, but by provident dispensation, she rightly deserved to hear: “O woman, your faith is great. Let it be done to you as you wish.” Indeed, she had great enough faith, since she knew neither the ancient miracles, commands, and promises of the prophets, nor the more recent ones of the Lord himself. In addition, as often as she was disregarded by the Lord, she persevered in her entreaties, and she did not cease knocking by asking him, though she knew only by popular opinion that he was the Savior. On account of this she secured the great object for which she implored when, as the Lord said, “Let it be done to you as you wish,” her daughter was healed from that hour. This woman, by nature a gentile, but constant and believing in her heart, rightly signifies the faith and devotion of the church gathered from the nations, which holy preachers expelled from Judaea inspired with the word and the mysteries of Heavenly grace. Now let us take a look at the preceding reading from the holy Gospel. We will find that scribes and Pharisees, coming from Jerusalem, assailed the Lord and his disciples, making a great outcry because of their lack of faith, and Jesus soon left them, having rebuked them with the invective they deserved. And going on from there he entered into the regions of Tyre and Sidon. Clearly it is prefigured here that after his passion and resurrection the Lord, in his preachers, was going to leave behind the faithless hearts of the Jews and move on to the regions of foreign nations. Tyre and Sidon, which were gentile cities, indicate the strongholds of gentile teaching and life, in which the foolish trust. Hence it is good that the woman, who in her belief entreated the Lord, is reported to have come out from those territories, for unless the church had left the vain dwelling-places of her preceding way of life, she would never have come to Christ; unless she had denounced the dogmas of her old error, she would never have known to adopt the new grace of faith. The daughter beset by a devil, for whom the woman entreated, is any soul in the church that is delivered up to the deceptions of malign spirits rather than to her maker’s commands. The church, as a solicitous mother, must intercede for this soul so that since the church is not capable of converting such a one by warning, entreating and rebuking her outwardly, Christ may convert her by inspiring her interiorly, and, when she has been turned from the darkness of error, he may rouse her to the acknowledgment of the true light. But if the Lord keeps the church waiting for an answer as she asks in tears – that is, if he keeps those who wander waiting before giving them the deliverance of mind for which she has entreated – it is not that she should desist from asking, seeking, and knocking, nor that there should come over her a despair of having her request granted. Instead she should persevere with great earnestness; she should resort to the Savior crying out obstinately, and among her petitions she should seek to obtain the support of his saints until they too offer supplications to the Lord from Heaven that the church might be heard. And thus it will happen that, if she does not turn aside her mind from its proposed intention, she will by no means be deprived of the fruit of her request. One who intervenes, either for the sake of his own weakness or for the sake of others, will obtain the desired effect. Being submissive with due humility, such a person must not judge himself to be worthy of the company of the sheep of Israel (that is, souls that are pure), but instead he must be of the opinion that he should be compared to a dog and that he is unworthy of Heavenly favors. Nevertheless, let him not in despair rest from the earnestness of his entreaty, but with his mind free of doubt let him trust in the goodness of the supreme benefactor, for the one who could make a confessor from a robber, an apostle from a persecutor, an evangelist from a publican, and who could make sons for Abraham from stones, could turn even the most shameless dog into an Israelite sheep. He may even bestow upon him, as a reward for chastity attained, the pasture of eternal life – that is, he may deign to make righteous a sinner who has turned from his evil way, and as a reward for his good action he may lead him to the Heavenly kingdom. Seeing how great is the ardor of our faith, and how tenacious is the perseverance of our praying, the Lord will show mercy. And may he also grant to us what we wish may come to be, namely that with the tumults of our depraved thoughts expelled and the bonds of our sins loosed, both the pure serenity of our mind and the perfection of our good works may be restored. Meanwhile, we must note that this tenacity in praying can only deserve to bear fruit if what we ask for without mouth we also meditate on in our mind, and if the crying of our lips is not cut apart in another direction from the focus of our thoughts. For there are some who, upon entering a church, stretch out their psalm-singing or their prayer with many words, but because their heart is directed elsewhere, they do not even reflect upon what they are saying. They pray, to be sure, with their mouths, but they deprive their mind, which is wandering outside, of all the fruit of their prayer. 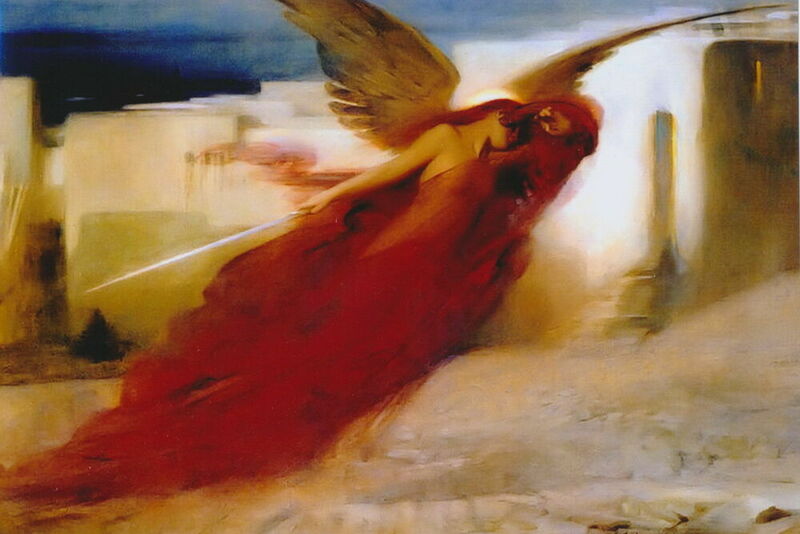 They suppose that their prayer is heard by God, when not even those who pour it forth hear it – there is no one who cannot perceive that it has been done at the instigation of the ancient enemy. He is aware of the benefit of praying, and he envies human beings the gift of having their requests granted, so he sends upon those who are praying many kinds of frivolous thoughts, and sometimes too phantasms of things that are shameful and harmful. By these he can interfere with prayer in such a way that occasionally, when we are prostrated in prayer, we may endure great surges of thoughts which run every which way, thoughts such as we have not known ourselves to endure even when we are lying flat on our backs in bed. Hence, dearly-beloved brothers, we must take care to triumph over the acknowledged malice of the devil, clearing our mind, as far as we can, of every sort of cloud which the enemy rejoiced in sprinkling about, and begging for the continuing protection of the benevolent defender, who is able to grant to those entreating him, no matter how unworthy they are, both the grace of praying in a pure way, and that of having their requests granted completely. The purity of our prayer will help us a great deal if in every place and time we restrain ourselves from forbidden acts, if we always check our hearing along with our speaking with regard to idle conversation, if we habituate ourselves to walking in the law of the Lord and scrutinizing his testimonies with all our heart. Whatever things we are accustomed to do, speak, or hear most often, these same things will necessarily return to our mind most often as though to their accustomed and proper place. And just as pigs are accustomed to frequent marshy wallowing places, and doves to frequent clear flowing streams, so too impure thoughts disturb an unclean mind, and spiritual thoughts sanctify a chaste one. If, after the example of the Canaanite woman, we continue resolutely in our praying, and remain of fixed purpose, certainly the grace of our maker will be with us to correct everything in us which is wrong, to sanctify everything unclean, and to make serene everything which is turbulent. He is faithful and just, so that he will forgive us our sins and cleanse us from every iniquity, if with the attentive voice of our mind we cry out to him who lives and reigns with the Father in the unity of the Holy Spirit, God for all ages and ages.